Sometimes, an interesting story loses its charm if stretched meaninglessly. 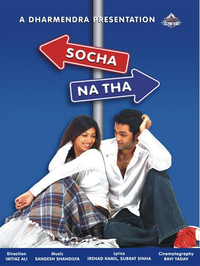 Imtiaz Ali, the debutant director and writer of Socha Na Tha, has done a good job in both capacities. Being the urban guy he is, settling with a girl of his parent’s choice is a big no no for him. Thank god for the animated aspirations of young, urbane, hip cinema. At least it moves.